All about the Ecuador Magic Mushroom! The Ecuador Magic Mushroom is a thick-stemmed magic mushroom with spade-shaped hats comes from the Ecuadorian highlands. The Ecuador magic mushroom kit grows dense flushes of shrooms. If quantity is what you are after, this is the psilocybe cubensis strain for you. Crazy colors, creative designs and weird pictures! The Magic Mushroom Shop is going to show you the best clothes out there. Last time, we took a look at some headwear and hoodies. 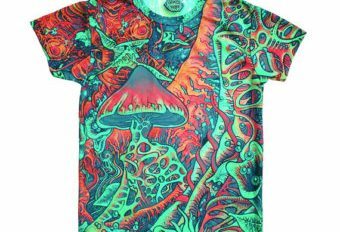 Today, we’re going to take a look at the top 10 psychedelic t-shirts out there! Once a month The MagicMushroomsShop brings you a brief ‘’News Digest’’ of what we feel are some of the most interesting articles related to psychedelics, the innerself (meditation, mindfulness, yoga), and anything else we find ‘’trippy’’. Here are our 5 selections for April. Psychedelics, it’s a lifestyle :)! The Magic Mushroom Shop is going to show you best clothes out there. Last time, we took a look at some hoodies. Today, we’re going to take a look at the 10 most psychedelic headwear out there! We’re proud to announce that we expanded our line of natural products. The Magic Mushroom Shop added CBD supplements to the website. We’ve joined forces with CBDirective, a herbal food supplement company from The Netherlands, to introduce our customers to the wonderful health benefits of CBD supplements. The Red Boy Magic Mushroom is known for its wide caps and meaty stems. Some say they grow faster than most strains. The cool thing is that it appears it was resurrected from a 20-year-old print. This strain is quite unique in the world of cubensis as it drops red colored spores. The Red Boy Magic Mushroom is quite a specimen for all mycologist. Psychedelics, it’s a lifestyle :)! In this new age, the world wide web is filled with a lot of cool clothes that go hand in hand with psychedelic themes. Why should you only wear basic clothes from the Zara or H&M? In this Top 10 Psychedelic Fashion Series we’re going to share a selection of clothes that are fun, colorful and creative. Today, we’re going to take a look at some fresh hoodies! Keeping up the momentum that cannabis legalization set, a Colorado group is trying to decriminalize magic mushrooms. Representatives of Colorado Psilocybin met with Denver city officials this week to discuss a possible ballot measure. The Treasure Coast Magic Mushroom is known for its very large flushes and it is a favorite among amateur mycologists because it is very resistant to contamination. Once a month The #MagicMushroomsShop brings you a brief ‘’News Digest’’ of what we feel are some of the most interesting articles related to #psychedelics, the #innerself (#meditation, #mindfulness, #yoga), and anything else we find ‘’trippy’’. Here are our 5 selections for March.